There isn’t much about the plot that can’t be gleaned from the trailers because it isn’t that convoluted. Lee is a single janitor working in Boston proper while Patty has a rich life complete with multiple girlfriends in Manchester, which is somewhere closer to the Sea than Boston. After gaining custody of Patty, Lee is left with the difficult choice of whose life gets upended. Much of the conflict comes from these two fighting to maintain the status quo. Lee is an accommodating guy looking for a playbook on how to handle this situation but he’s haunted by a past that causes him to betray his better judgement. Coming into the movie the lead character’s biggest flaw isn’t anything new to discover but what we’re looking for is a revelatory backstory and hope for his future. The idea of men mishandling their softer emotions is a trope that dates back to cave paintings so we’re not breaking ground here. 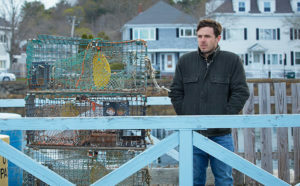 Casey Affleck is looking to perfect the wheel and does so by delivering an on point muted, dead-inside performance that sets the bar for future muted, dead-inside performances. As the movie digs deeper into his past through a smattering of flashbacks, we learn more about what makes his character tick. After we get the full story, it’s pretty obvious why he is the way he is and his portrayal is really the only realistic response you can expect from a human. Too many times, I feel like movies don’t want to go to these depths and actors are not willing to completely let go of the rainbow of emotions that they are so desperate to display. Now I don’t want to make it seem like Casey Affleck is pulling a mannequin challenge the entire time. He plays everything well enough that you recognize him as a fellow human with a capability of emotions and you can see his internal struggle because he doesn’t want to be as hollow as he is. For those out there who are not as into watching an empty vessel of a man find his soul again, the movie does bring levity and counterpoints to Affleck’s performance. Most of this can be attributed to the young Lucas Hedges. If you’ve seen any trailers for this movie, then you’ve seen the praise he’s already getting for a “breakout” performance and although I was skeptical coming in, he really does deliver. 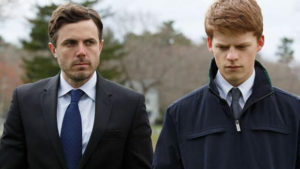 His character handles the loss of his father in a wholeheartedly different manner than Affleck’s and without his delicate approach, the movie would have fallen into much darker places than it intended. You can see the effort by the writer/director Kenneth Lonergan to keep spirits up despite the dismal subject matter. Similar to a parent trying to distract their baby who they know is about to burst into tears, he sprinkles humor into key points in the movie. It’s a risky proposition that works 99% of the time here. I didn’t expect as much humor as I got coming into the movie so I was hesitant to laugh with my fellow moviegoers. Seeing a movie in a theater compared to at home always brings added pressure to react like the crowd. I resisted the urge to laugh at a few early bits because I wasn’t sure where we were going yet. Eventually though, I got with the program. But during a particularly hard scene to watch, there is a moment that is played for a chuckle where I choose instead to let the sadness wash over me. There were a few giggles in the audience so I was a little confused. Surely, they wouldn’t want to underplay what feels like an integral moment in a key character’s backstory, I thought. Looking back now, maybe the intention was to keep my mind occupied so I didn’t focus on what just happened. I may have lost it if I had. Leaving the theater, I wouldn’t describe my feelings as sad but something more contemplative. There’s a lot to digest in this movie and as an uncle myself I was just lost in thought. How would I react in this situation? I like to think I’m better adjusted than the Lee character but equally unprepared for that kind of responsibility. Was the movie as funny as the crowd reactions or did I just happen to watch the movie with a crowd of psychopaths? I guess it was pretty funny when Affleck goes full Bostonian and says “parked the car” (He literally says that). Through it all, I’m glad Affleck is getting Oscar buzz but not because he necessarily “deserves” it the way Leo did last year but because recognition of his performance would validate everything I look for in movies.